What's that in your cornmeal? You're thinking about making Grandma's Southern Cornbread. You head for your pantry. You remember that six months ago you purchased a bag of cornmeal from a local supermarket and that you immediately emptied the contents into a glass jar with a tight-fitting lid. You open the airtight jar and notice something strange. It's moving. Moving? Moving? Yes! It's crawling with a transparent carpet of dozens of nearly microscopic critters. What? First, what are they? If you're like me, you grab your camera--in this case, a Canon EOS 7D with an MPE-65mm lens that can magnify an insect five times its life size--and click the shutter. You post the photo on BugGuide.Net and request an identification. The entomologists all agree: They're booklice, Liposcelis bostrychophila. These Liposcelis bostrychophila, or "psocids" (pronounced "so kids"), are common pests in stored grains. They're usually unseen because they're about a millimeter long--about the size of a speck of dust--and are transparent to light brown in color. They're also wingless, but can they ever crawl! Fact is, their name, "lice," is misleading. 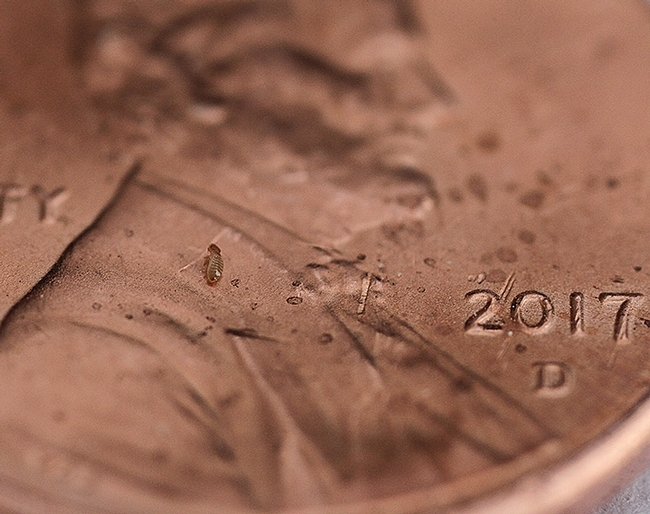 These tiny insects are not lice; they are not parasitic. And they're everywhere. They feed on flour, cereals, grits, molds, fungi, papers, books, pollen, dead insects and the like. In fact, you've probably unknowingly eaten them--or parts of them--in your pancakes, your oatmeal or maybe even your chocolate birthday cake. Entomologist Jeff Smith, who curates the butterfly-moth collection at the Bohart Museum of Entomology at UC Davis, took one look at the photo and commented: "They're pretty thick in there!" 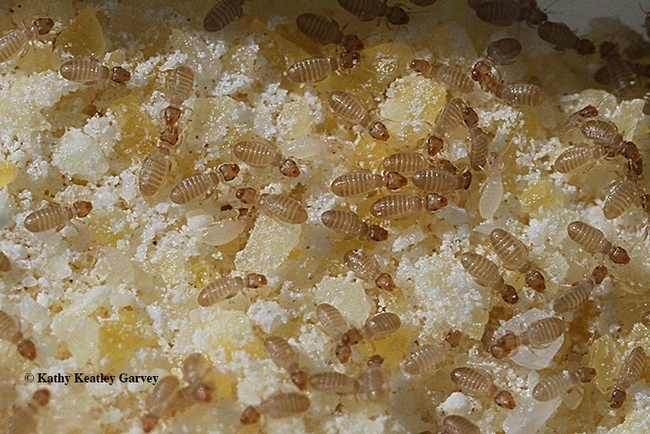 "Booklice can be scavengers and often feed on the bits of mold or fungi that grow on damp materials," Smith explained. "Very old, neglected food stuffs are also subject to them, and the key to prevention is to use food materials reasonably quickly and not store them for years, store them in a nice dry location and in airtight containers." "They very well could have been in the food already when you bought it, but they're so common that you probably have some roaming around in the house all the time, just looking for something good to eat. They'll feed on dead bugs in window sills, stale pet foods, etc." 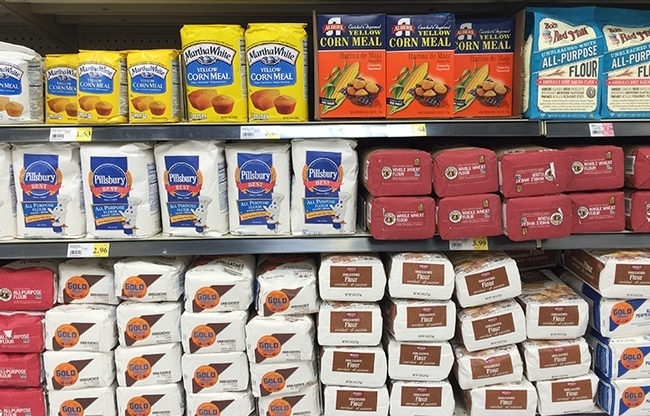 If you're worried about what's in your cornmeal, flour, oats, biscuit mix, cake mix and other stored foods, you can pop the contents in your oven at about 120° for a half hour, and then transfer them to an airtight container, Smith says. "Your food should be okay--albeit perhaps containing a few dead booklice. We had them in an old bag (paper) of rice one time, and in several packages of cornmeal mix that were forgotten in the back of our cupboard." A UC Davis colleague said he's seen them crawling in his flour, but his wife made pancakes from them anyway. No issues. No problem. "Just protein!" he chortled. And from another colleague: "I once had an entire case of instant grits. The grits were completely factory-sealed in unopened plastic bags. I opened the bags and the grits were poured into hot water, but they would not sink and mix with the water. Instead the grit floated on the top of the water. 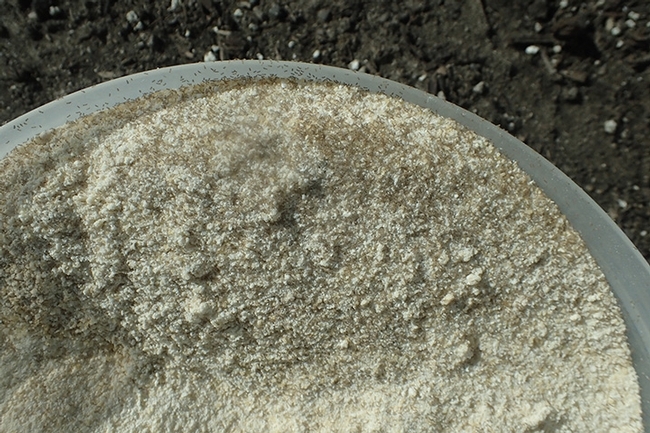 I opened a second bag and looked at the grits under my stereo microscope. Each and every grain of grit had two or three little six-legged creatures standing on each grit. These creatures were 100 percent transparent, the only color was in their bodies which was the same color as the grits they were eating. I opened every 100 percent factory-sealed bag, and every bag was contaminated in this matter." "There is nothing new about insect contamination of grain products," she added. "Another personal experience was a biscuit mix. For no particular reason, I sifted the biscuit mix while making the batch of biscuits. After sifting several cups of biscuit mix, in the sifter screen there were 4 worm-like creatures about the diameter of a standard pencil and about an inch long. These worms were 100 percent transparent, each filled with the white biscuit mix. "Consider we all eat insects, spiders, and urine and feces of all sorts of animals." We live in world where we all eat bugs, whether we know it or not. Sometimes we may not want to know! Statistics indicate that the average American unknowingly eats one to two pounds of insects a year. But the U.S. Food and Drug Administration "has very specific tolerances for the amount of residue in food stuffs," said Lynn Kimsey, director of the Bohart Museum of Entomology and professor of entomology at UC Davis. Want to know what the action level is? Check out this FDA document. And the next time, you're yearning to make Grandma's Southern Cornbread, you might want to check for bugs first. Or maybe not. You might not want to know!